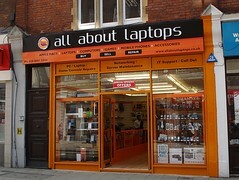 Laptop, PC, and game console sales and repair shop on George Street. They sell both new and refurbished stock, and will also buy. See also photo of flyer collected in August 2012. All About Laptops opened some time between February and July 2012; the premises were vacant as of mid-February 2012 photo and before that were occupied by Gamestation (as of July 2009, according to Google Street View and also to a photo on Flickr). Last edited 2019-01-22 18:11:29 (version 32; diff). List all versions. Page last edited 2019-01-22 18:11:29 (version 32).